Choucroute Garni, Thyme for Cooking gourmet menus. This is something I like to fix at least once each winter.... As time is running out, today is the day. 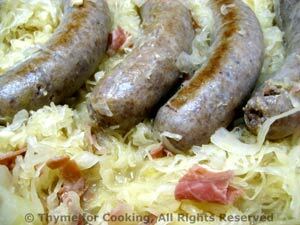 Sauerkraut can range from very strong to very salty to nicely flavored. This recipe assumes it's strong. Taste it, rinse it, taste it again and rinse again if needed. The recipe will add in more subtle flavors. It's often served with spaetzle. 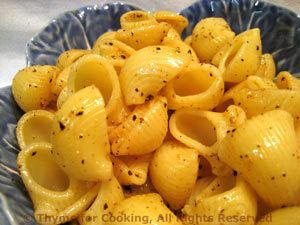 We've opted for pasta in Browned Butter. Use egg noodles if you have any on hand. This was a staple in my family when I was a child. It's simple to make: brown the butter and add lots of black pepper. Salt is optional. It works well with just about everything, or all on it's own. Return pasta pan to medium heat. Add butter and sauté until it turns golden brown, being careful not to let it turn too dark or it will taste burnt. When brown add as much black pepper as you like, and salt if using. The butter will foam. Add the pasta and quickly stir with a spatula to coat and heat through.